Simple and easy, these smoky beef tacos are a great crowd pleaser! 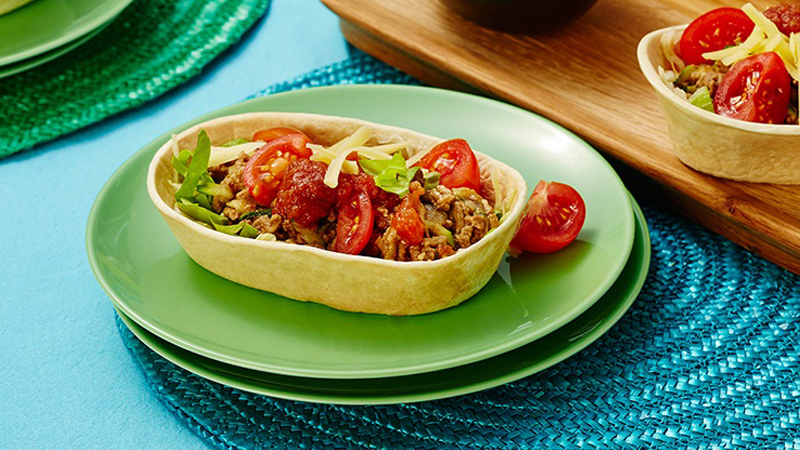 Stand ‘em and stuff’em in Old El Paso’s™ soft taco shells for your next fiesta! Heat a little oil in a frying pan. Add onion and cook, for 5 minutes, stirring occasionally, until softened. Add beef and cook for 5 minutes, stirring with a wooden spoon to break up lumps. Add zucchini and cook for a further 2 minutes. Add Smokey BBQ Seasoning Mix and ½ cup water. Simmer 2 – 5 minutes until sauce thickens. For Warm Tortillas Follow on pack instructions. Build your own soft tacos with lettuce, smokey beef, cheese and Taco Salsa.